If you’re anything like me, you like to use multimedia in the classroom. From tried & tested documentaries from the BBC, Discovery Channel, etc, to shorter clips and audio tracks, my students are well-supplied with a large range of supporting materials. Each of these options, though, come with drawbacks. With the networked drive, students can’t take media home to watch for review, and resources that span several subjects can’t be easily shared with staff in different departments without duplicating them. DVDs are easily lost or scratched, and on Youtube uploaders can choose to remove their videos at any time. Youtube also comes with the battlefield of the comments section, which is often the reason for schools & school districts filtering access to it. Finding the perfect resource is always exciting, and finding that it has disappeared out of the blue just before you need it can be a real pain. On September 30th, 2014, Google announced that Google Apps for Education (GAFE) accounts would have unlimited storage. 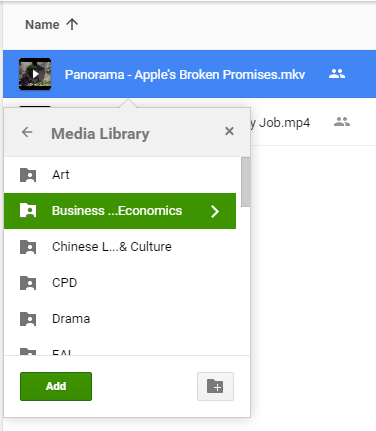 Google Drive not only allows the uploading of video files, but the streaming & embedding of them. This can effectively turn an institutional GAFE account into a private, curated Youtube. With the sharing settings for all files set to ‘Anyone at your institution who has the link can view’, you restrict anyone outside the school from accessing anything you have uploaded. Resources can be shared by email or embedded on course websites. When someone attempts to access these resources, they are prompted to log in to their institutional GAFE account. By restricting access to only students & staff of the school, you are not simply distributing material without restrictions. This means that the intended audience of resources stored is the same as it was for the VHS cassettes kept in prep rooms since the 1980s. If you are in the UK and your school has an Educational Recording Agency (ERA) licence (as most schools do – check with your head), you are entitled to record and show broadcasts from virtually all UK broadcasters. Intellectual Property Office (2014). Exceptions to copyright. Nonprofit educational institutions can record television programs transmitted by network television and cable stations. The institution can keep the tape for 45 days, but can only use it for instructional purposes during the first ten of the 45 days. After the first ten days, the video recording can only be used for teacher evaluation purposes, to determine whether or not to include the broadcast program in the teaching curriculum. If the teacher wants to keep it within the curriculum, he or she must obtain permission from the copyright owner. The recording may be played once by each individual teacher in the course of related teaching activities in classrooms and similar places devoted to instruction (including formalized home instruction). The recorded program can be repeated once if necessary, although there are no standards for determining what is and is not necessary. After 45 days, the recording must be erased or destroyed. A video recording of a broadcast can be made only at the request of and only used by individual teachers. A television show may not be regularly recorded in anticipation of requests—for example, a teacher cannot make a standing request to record each episode of a PBS series. Only enough copies may be reproduced from each recording to meet the needs of teachers, and the recordings may not be combined to create teaching compilations. All copies of a recording must include the copyright notice on the broadcast program as recorded and (as mentioned above) must be erased or destroyed after 45 days. Stim, R. (2010). Educational Uses of Non-coursepack Materials. Unfortunately, these rules would effectively prevent US schools (or schools covered by US copyright law) from collating copyrighted materials in to a whole-school collection. The critical difference here is that UK law treats a school as an entity, whereas US law covers teachers individually. If your school is in a jurisdiction other than the UK, you should investigate the copyright law that applies to you. While everything stated here would be fine under UK law, you cannot assume the same will be true elsewhere. No paid-for resources we haven’t paid for. This means attempting to find a copy for sale of any recorded resource before uploading. No resources that generate revenue based on hits (Crash Course, Smarter Every Day, etc). Due to the business model here depending on traffic, you can reasonably count on these videos remaining online on Youtube anyway. As you can see from the image to the right, files are stored in folders just as they would be on a hard drive, but with one fairly major exception: items can be added to multiple folders. So if a documentary would be equally at home in two different subject areas, hit Shift+Z (see below) to have it appear in both folders without the need to duplicate it. You’re still restricted to browsing through folders, though, and with nothing more to go on than file names. This can making finding a resource difficult. An ideal next step for a growing media library would be to create a catalog of the resources, by either adding them to an existing library catalog system, or creating one using the open source software, Omeka. 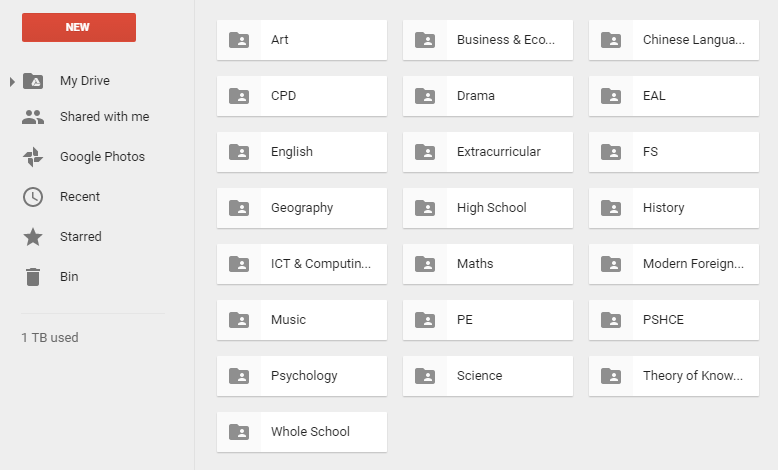 This will allow for the creation of collections (rather than folders) for each subject, adding metadata (including descriptions & tags) and make the resources much more accessible to students and staff. If you’re a GAFE user, it’s well worth investigating! Cover image by mapbox on Flickr.